What’s the best way to handle someone who is making you downright miserable at work, always competing with you, raising your stress level, being combative—or worse? Should you get your manager involved or try to resolve the issue yourself? What if it IS your manager? Q1: What are the most common forms of rivalry that you’ve seen? @bbenishek: The co-worker who thinks other co-workers slack but get paid more. @dianaantholis: Competition for attention from the higher-ups to get praise, and taking credit for other’s work. @myFootpath: If you got an assignment/position/title that someone else wanted…watch out! @degreestoday: When more than one candidate is up for a promotion! @ComeRecommended: I’ve seen a lot of rivalry when it comes to hierarchy. Also competing for a top client/project. @bizMebizgal: Rivalry can also happen between two very competitive people even if they are not going for the same thing. @SaleStart: Competition can be good ~ In the world of sales competition can help inspire employees to reach higher. @PushJobs: Rivalry between managers of diff depts fighting for limited resources and employees in competition with one another. @myFootpath: Rivalry pet peeve: Throwing someone under the bus behind their back, so they can’t address it. @bbenishek: It’s almost worse if the boss believes it without hearing the other side. @dianaantholis: And worse when that person finds out what you were saying! @kbaumann: One-uppers = those that ALWAYS have to out-do you, regardless of your hard work. This is very common in the workplace. @WomensAlly: Rivalry internalized can lead to perfectionism and work product paralysis. In addition, it can impact your health. Q2: What is the best way to approach the situation when you have a rival? @PushJobs: Continue to shine and never take it personally. Usually the “rival” is competing with inner/personal issues. @StartWire: If you are being challenged by rival, always ask why, what’s motivation. Feelings > behavior. @kbaumann: Approach with caution & respect. Be honest, but don’t attack them. It may just be their personality. @degreestoday: Know it exists, but don’t let it bother you. Have confidence in yourself, but don’t be cocky. @AnneMessenger: 2 choices w rival: War or work-it-out approach. I pick the 2nd – takes EQ, work, maturity and patience. @ComeRecommended: Focus on yourself and don’t get caught up in unnecessary drama. @WomensAlly: Drama is career suicide. @bbenishek: Communicate where you can, get a mediator if necessary, walk away if you have to. More important to get YOUR job done. @joesabado: Take the high road. Don’t take things personally. Focus on what to do best. Look for partnership opportunities with rival. @ZinZooMe: We need to be able to see the big picture and not get caught in the minutiae of the moment. @WriterChanelle: I always try to understand the other person’s reason for being my rival. I don’t knowingly create conflict. @jim_horrell: Keep in mind you can only control 2 things: 1) Your thoughts, 2) Your actions. @LoisMarketing: Focus on your own goals, how you can improve. Don’t try to top another — focus on improving your performance. Q3: Are there any times when you should escalate a situation to a manager? @myFootpath: If you’re spending more time focused on the rivalry than your actual job, that’s a huge red flag. 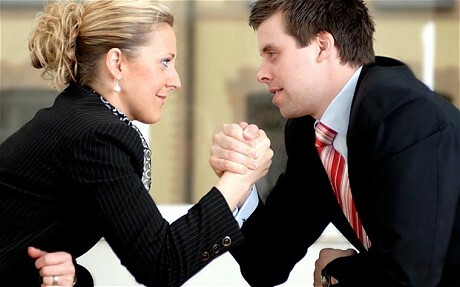 @ComeRecommended: If a rivalry is hindering the way you do your job–then yes, manager/HR needs to get involved. @dianaantholis: Abusive (verbal or phys), really upsetting you so you can’t do work, lying, getting you in major trouble. @MyPath_MP: If it gets malicious and/or could impact the company’s success. Just be careful to not come off as the villain. @bbenishek: This is where documentation is extremely helpful, and/or witnesses willing to back you up. @myFootpath: In my experience, if someone is causing trouble, sooner or later everyone knows their game. The truth comes out in the end. @LoisMarketing: Rise above. Take a leadership role to bring co-workers together first, then involve manager. Q4: Any personal successes or failures in dealing with rivals? @ComeRecommended: Ended a rivalry by joining forces; sort of got the best of both worlds that way. @myFootpath: “Kill them with kindness” has worked for me! @dianaantholis: Just kept doing what I was doing. Felt sorry for the other. @zachhisert: If you are nice and rival is not, ppl usually side with you. @WriterChanelle: Sometimes it’s possible to convert someone who is a rival, but those are the open-minded people. 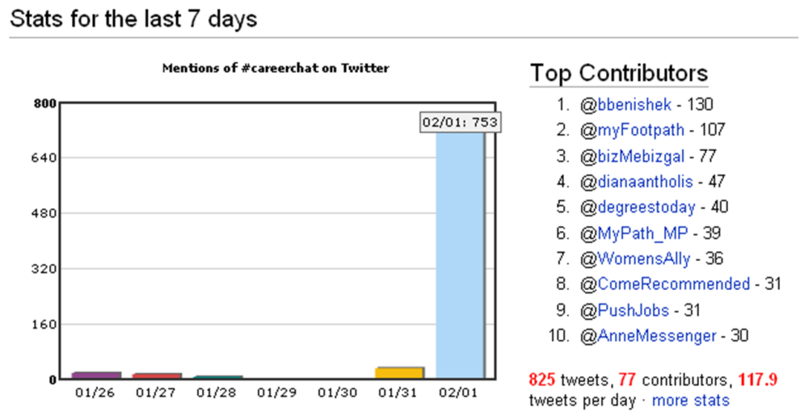 #Careerchat was so awesome today! I loved this topic! I did too! I love it when the topic really resonates with everybody.